Right: Expression of P. falciparum centrin in schizonts. P. falciparum parasites were probed against mouse anti-PfCEN1, -2, -3, and -4 antibodies. Centrins are associated with the mitotic spindle.Left: Immunoelectron micrograph showing reactivity with the P. falciparum centrin-2 antibody. The gold particles associated with the nucleus of P. falciparum sporozoite stage parasite (A) and nucleus of asexual blood stage schizonts (B). N, nucleus; PVM, parasitophorous vacuole membrane; RBC, red blood cell. In sporozoites, IEM localization of PfCEN2 was observed as multiple dots in an area surrounding the nucleus suggesting a possible association with the centrosome. Similarly, in blood form schizonts, immunogold particles were seen to be associated with an area in proximity to the nucleus.Mahajan B, Selvapandiyan A, Gerald NJ, Majam V, Zheng H, Wickramarachchi T, Tiwari J, Fujioka H, Moch JK, Kumar N, Aravind L, Nakhasi HL, Kumar S. Centrins, cell cycle regulation proteins in human malaria parasite Plasmodium falciparum. J Biol Chem. 2008 283:31871-83. Expression of P. falciparum centrin in schizonts. 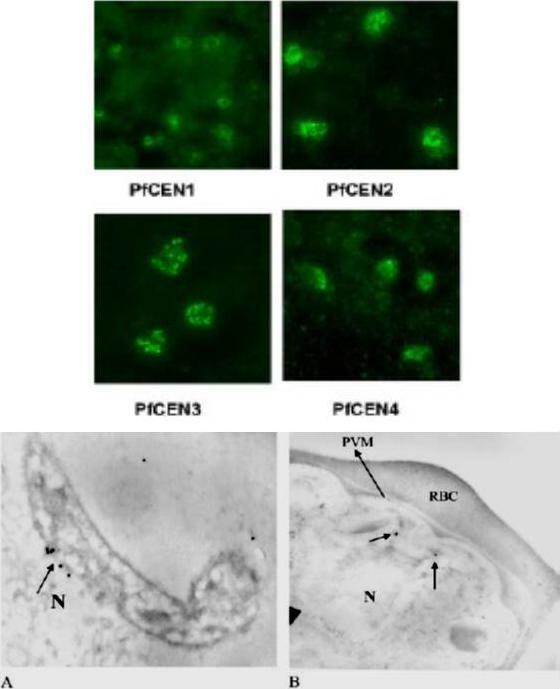 P. falciparum parasites were probed against mouse anti-PfCEN1, -2, -3, and -4 antibodies. Centrins are associated with the mitotic spindle. Immunoelectron micrograph showing reactivity with the P. falciparum centrin-2 antibody. The gold particles associated with the nucleus of P. falciparum sporozoite stage parasite (A) and nucleus of asexual blood stage schizonts (B). N, nucleus; PVM, parasitophorous vacuole membrane; RBC, red blood cell. In sporozoites, IEM localization of PfCEN2 was observed as multiple dots in an area surrounding the nucleus suggesting a possible association with the centrosome. Similarly, in blood form schizonts, immunogold particles were seen to be associated with an area in proximity to the nucleus.Mahajan B, Selvapandiyan A, Gerald NJ, Majam V, Zheng H, Wickramarachchi T, Tiwari J, Fujioka H, Moch JK, Kumar N, Aravind L, Nakhasi HL, Kumar S. Centrins, cell cycle regulation proteins in human malaria parasite Plasmodium falciparum. J Biol Chem. 2008 283:31871-83.